Last year I set about converting by recumbent bike to electric assist. I thought some might be interested in how it turned out. I added an ordinary bike computer to it to give me an idea of speed. 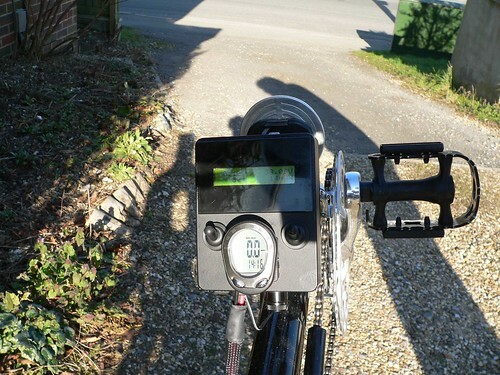 The electric conversion adds about 6.5kg in total to the weight of the bike. It gives a very useful assist up to about 15mph, then runs out of puff. 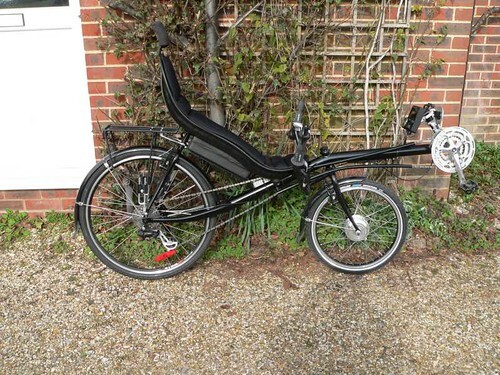 I use it mainly for hill assist - I've yet to find a hill that it won't power up without me pedalling, which is a great boon, as hill climbing is not my strong point. Very tidy job Jeremy. What sort of range do you get from it and what power is the motor or should I not ask? Range is around 25 miles or so, but I've not tested it fully as I only use it for relatively short trips. The motor is fully legal, as the motor gearing means that assist stops at about 15mph. The motor is actually rated at 240 watts continuous I believe, but the controller current limit is set to 15 amps, so the maximum input power to the motor can be as high as about 550 watts. I find that the average power is around 100 to 150 watts, although this is just a guess based on mentally averaging the power meter readings. The motor is quite a neat design, as it's a three phase brushless design with no Hall sensors - the controller uses the back EMF from the non-energised windings to determine timing, rather like an RC electric motor. This means that there are just three wires going down to the hub, rather than the eight wires that a brushless motor normally needs. The motor gears are also novel, in that the epicyclic "gearbox" is actually made up using rollers, rather than gears. This makes it totally silent, with no gear whine at all. 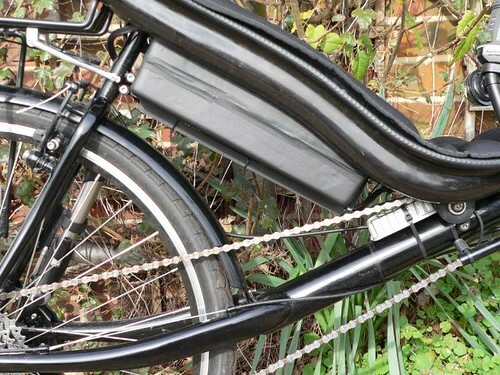 The reduction drive includes a pawl-less freewheel, using a one-way roller clutch, so that the bike can be ridden motor off without excessive motor drag. Best of all, the parts were cheap. The motor hub costs around Ã‚Â£35 as does the controller. All told the total cost for the controller, throttle and motor came to about Ã‚Â£120 including shipping, duty and VAT. Some people have found these motors to be unreliable, but so far mine's worked flawlessly (says he, touching wood quickly..........). That's amazing what a bargain! The motor and controller is from Tongxin, in China. Their website is http://www.tongxin.net.cn/en/summerise.htm. The contact there is Diana Lin. The batteries are from Li Ping, an eBay seller with the user name pingping227 on http://www.ebay.com. Li Ping will sell direct, rather than via eBay, if contacted through eBay. I just wondered where you bought the motor from? Was it direct from Tongxin? I actually got my motor and controller from Justin Lemire-Elmore at http://www.ebikes.ca as he had some on sale as surplus to requirements. I know that several people here in the UK have purchased direct from Tongxin, though.